Always turn off your engraver before plugging in or pulling out a cartridge. The sockets are numbered from left to right U1, U2, U3, U4. Place the logo chip in the first socket (U1), and push the lever down to lock the chip in place. 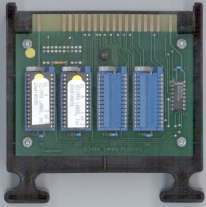 Place the chip in the socket with the yellow dot on the end of the chip toward the gold contacts on the cartridge. Failure to do so will cause permanent damage to the chip!!! Some logos require more than one chip. All the chips must be used to make the logo work. Place the #1 chip in socket U1, #2 chip in socket U2, #3 chip in socket U3 and the #4 chip in socket U4.. Never skip a socket. With the engraver off, insert the cartridge into any of the open cartridge slots. Turn the engraver on. Set up the engraving program like you normally would. From the composition screen, move the cursor to the font selection. Type in LL (for Lamro Logo). Move the cursor to the input text line at the bottom of the screen. Type the capital letter A to represent the logo on the text line. Press start and finish your setup to engrave. NOTE: Only one logo can be accessed per cartridge. This is an OPEN TOP cartridge. The open side goes UP.